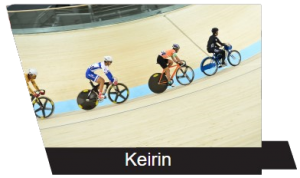 The keirin is a fast and exciting event featuring speed, strength and courage.It is raced over a distance of 2000 metres with a maximum field of seven riders.A Derny paces the field over the first 1400 metres,starting off at 30km/h and bringing the riders up to 50km/h (Women’s keirin 25-45km/h).Riders maneuver for the most favourable position before the derny leaves the track.No cyclist is permitted to pass the Derny,which departs with two and a half laps remaining, and then the battle begins. 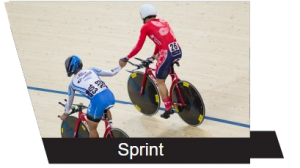 The sprint is one of the traditional forms of track cycling competition.The individual sprint is a short distance event, which two or more riders compete in over three laps or 750 meters. A typical sprint competition divides into qualifying and a series of final race. Qualifying race sees individual riders timed over the flying 200 meter distance and seeded according to their qualifying times. The requirement of the sprint are strength and speed.The key is tactics.Sudden and strategic changes of speed stand still attempts and feints are typical ways of surprising the opponent. This is a true test of technical skill, tactics and teamwork. 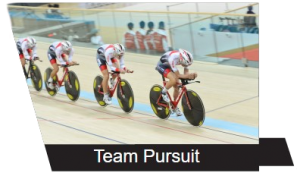 Four cyclists line up and their success relies on how well they work together. The rider on the front must keep the pace as high as possible but not ride so fast that they surge away from their teammates. The cyclists must ride as close as possible to the rear wheel of the rider in front of them to gain every possible aerodynamic benefit but make sure they don’t touch wheels. The riders swing up the track at the end of their “turn” on the front leaving the next rider to set the pace. The time is taken on the front wheel of the third rider to cross the line. 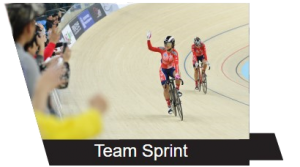 The team sprint pits two teams of three riders (two riders for women) against the clock and each other over three laps (two laps for women) of the track. The task of the starting rider is to get out of the gate cleanly and bring the team up to a high speed as quickly as possible. After one lap the first rider peels off to allow the next rider to make the pace. The leading rider must not swing up until a full lap is complete and must peel off between an area of 15 meters after the start line otherwise the team will be disqualified. It is designed to formulate the “ironman of cycling” and discover the most versatile cyclist of track racing. 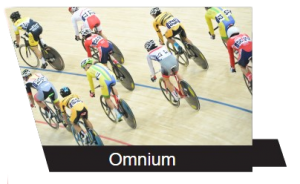 The omnium is made up of 6 events and is disputed over 2 consecutive days.The final classification is established as follows: the points accumulated by the riders over the first 5 events, on the basis of the points scale in force, are added up. During the 6th and final race, this total may increase or decrease according to the points won or lost by the rider. The winner is the rider who has the highest total of points at the end of the 6th event.